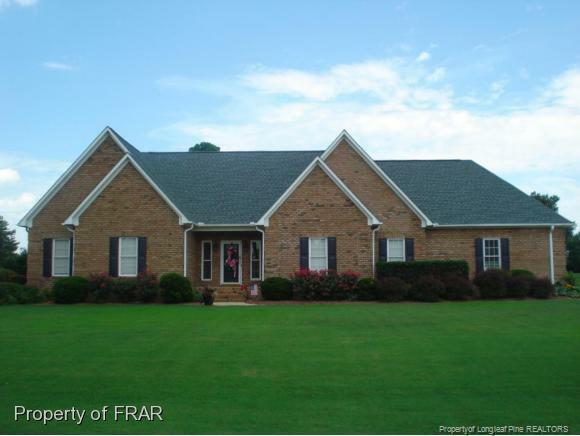 Beautiful Custom Built Brick home located just outside of Dunn in Sandy Ridge on the golf course - #10 Fairway. Situated on .60a., this home features an open floor plan with columns, 3BR, 2BA, family room with fireplace, nice kitchen w/bar & custom built cherry cabinets, stainless steel appliances, huge master bedroom w/sitting area & master bath w/jetted tub, bonus room, nice covered back porch, 2 car garage & a golf cart garage. GREAT SCHOOLS & NO CITY TAXES & NO HOA DUES!! Must See! !